Santa Cruz map of the only real Tenerife city for things to do like shopping. Just now, you may see a map of Santa Cruz the Tenerife capital with its center shopping area by Plaza de España and Plaza de Candelaria next to the Atlantic ocean. Discover all road direction arrows in the map of Santa Cruz de Tenerife capital. Study them well and take note, as not to turn into a street, where entrance is forbidden. Spot La Hierbita on this Google Santa Cruz Map. It is the nostalgic restaurant which is also open for Christmas and new Year's lunches. Calle Bethencourt Alfonso of Santa Cruz map of downtown shopping. One of Tenerife's most beautiful treelined shopping avenues for pedestrians only, while the most important with most shops is Calle Castillo. Please, mind Siesta time which is often between 1p.m.and 4.30p.m. Contrary to before, it must be noted that more shops are now also open on Sundays besides big malls. Good department stores such as Corte Ingles where the biggest and newest is by the main Titsa bus station may be found to the left of the map. (click arrow to to the left) and in the other direction just before reaching La Laguna on the way to Icod los Vinos on the TF5 freeway to Puerto Cruz and Orotava. There at San Cristóbal de La Laguna, you also find the only Ikea Tenerife Stores by the Freeway TF5 together with Decathlon for sports goods as well as the Alcampo Hypermarket of La Laguna, not even 7 km away from the Santa Cruz City centre. 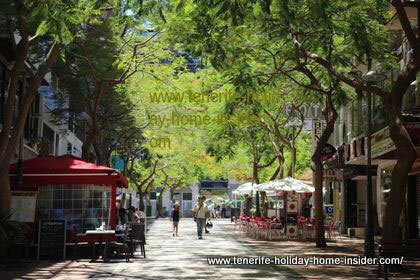 Go to general shopping on the biggest Canary Island which has most scope in and around the capital of Tenerife.